Even as humanity remains embroiled in its daily struggles of survival and success, the most mysterious, sacred and potent presence on the face of the planet in the Divine Self of Sri Sathya Sai Baba continues to awaken the God in millions of hearts, in a thousand different ways, in places close and very far from the seat of His Physical Presence – Prasanthi Nilayam, India. The first ever Divine Incarnation of international influence during His very lifetime, the story of the Sai Avatar continues to elude human comprehension. Yet, never for a moment does He stop in the holy task He has come to foster - to remind each of us of our own divine nature; that everyone is God and all is one. True to His words, this chronicle is yet another little episode from the love revolution initiated by a little village boy on 20th Oct 1940 in a remote place called Uravakonda, in rural India that has turned into a tidal wave, a global love tsunami, sweeping millions of seekers off their feet from corporate America to prisons in New Zealand! The current feature is a story of the most unexpected of spiritual seekers who are experiencing the bliss of Bhagavan Baba’s Reality in the least likely of locations, proving that God realization is not limited to such places as churches, temples, mosques, synagogues or the caves of the Himalayas. Bill and Arthur are two prison inmates whose cells are their seats of sacred and intense spiritual discipline. The Cosmic Consciousness that is personified in the person of Sri Sathya Sai Baba has revealed itself to them right there, inside the prison. Mr. Peter Phipps is a prison counsellor who became the chosen instrument of God in taking the Avatar’s message to these two inmates. “Very soon the Glory of Sai will spread to every part of the world. It will increase a thousand fold. The reason is the essential goodness of the Sai Mission. It is totally free from any taint. Every act is done out of the purest of motives. Everything that is said is based on Truth. All activities are conducted without depending on any outsider. Hence, there is no room for fear. After the harvest, when the sheaves of grains are winnowed, the wind blows away all the chaff, leaving only the grains behind. Through this process, the true devotees will remain steadfast. The wavering puppets will drift away. This is the process of winnowing." My name is Peter Phipps and this is the story of my path to prison ministry in New Zealand. I studied psychology while at University and gained a post-graduate degree in this subject. For practical experience, I joined the Probation Service in 1961 and was later invited to become a prison psychologist in 1962. I enjoyed the former job but hated the latter. 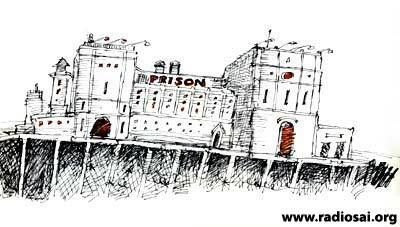 The Prison Service had grand formal objectives of rehabilitation, reformation and transformation of prisoners. In practice, it was a hotbed of negativity, destruction, anger and malevolence. I left it around 1968; I was a broken and disillusioned man. In the intervening years I observed prison policy and practice in New Zealand with some level of cynicism and despair. I knew that the high-sounding statements of politicians, publicly stated, were far from the truth. I first heard of Swami from an American hippie around 1975, but coming from a man who had once been into LSD and other mind-altering drugs, I was sceptical of his claim of having met God in flesh and blood. However, he introduced me to a form of meditation on light that I found very positive and especially helpful at a later time, as we shall see. The meditation is similar to what Ms. Phyllis Krystal teaches. I was active within the Christian church, on and off, over the years, and obtained work with the Salvation Army in 1989. In 1990, I attended a course for Victim Support offered by two Americans. Included in the course was a half-day workshop on mass murder counselling. The course members protested that these things do not happen in New Zealand , but the trainers insisted that this was part of their training. Ten days later, we had a mass killing at Aramoana, a small settlement near Dunedin in the South Island. I received a call asking whether I would be prepared to drop everything and join a team of three to work with survivors and the community. I was quite apprehensive about the job, but due to Swami’s Grace, we had been recently trained for just such an event. I am sure this was no coincidence [To read more about Victim Support Team, click here]. On the flight down, I started the light meditation, which I often used as a form of spiritual protection and support, and I asked God for His help, as I knew I could not do the job in my own strength. Immediately, I felt a powerful presence of Love and Wisdom and felt a strong current of energy flowing around us. This energy stayed with us all for the whole time we were working. Everyone on the team felt the energy and had the same experience. In the short time on the ground, we saw many miracles of healing happening before us. While giving thanks to God after the event , I heard an internal voice say, “I am greater than you know, seek Me out and find Me.” I started to enquire if there was anything about Jesus that I did not know. I started in a book shop dealing with “New Age” type of books, and in a few minutes, one book almost leapt off the shelf into my hand. It was “The Jesus Mystery” by Janet and Richard Bock. The book looks first at the life of Jesus and then describes Swami. I knew I had found what I was looking for. However, given my scientific bent of mind, I first tried to prove Swami could not be who He says He is, but I was unable to find any fault in Him. Subsequently, I made several trips to Prasanthi Nilayam. "Jesus sacrificed His life for the regeneration and welfare of mankind. Today, there are some who exaggerate the so-called differences between different faiths and, for their own selfish purposes, exploit these differences; they thereby bring a bad name to the founders of those religions, who were spiritual giants. No Prophet or Messiah asked his followers to hate other religions or the followers of other faiths. Every religion has declared that God is One and that the Divine dwells in every being. Jesus also proclaimed the Truth that the One Spirit resides in all beings." I became a lay minister in my Church and accepted other positions of leadership, and taught about Jesus in the way Swami had directed me. I undertook a diploma level course in theology and Christian history. I became well-known beyond the boundaries of my parish because of my work in opposing the building of casinos and gambling facilities. I was the Director of a weekend Cursillo (short course in Christian living) and got talking to Audrey Moonlight, the wife of one member of my team, who was involved in prison ministry. She told me that a “Faith Based Unit” was being established at a nearby prison and that they were looking for mentors and group leaders. After my earlier experience with prisons, I hoped that this would be an exciting idea that should prove to be a more positive experience this time around. So I applied for both opportunities and was appointed as one of four group facilitators in 2003, and joined the team working under a contract with Prison Fellowship New Zealand [To know more about Prison Fellowship, click here]. While the leaders and other facilitators of the team are Christians of a rather fundamentalist group who believe that “the only way to God is through Jesus Christ”, I am quietly more universal in my teaching. At different times we have had Moslems and Buddhists in the groups. We are supposed to convert them into Christians, but I liked to point out to the Buddhists how the teachings of Jesus and Buddha are the same, and start a session with “Allah-O-Akbar” when Moslems were present. It is always my objective to help them take one step towards God in whatever form they expect Him to be, just as Bhagavan Baba has taught us that paths are many, but goal is one. Our sessions are intended to be based on the Bible, and some prisoners expect me to produce a Biblical reference for every statement I make. Other prisoners ask questions beyond the general framework of the Bible, and I am happy to talk to them on any question, provided it is spiritual. At Aramoana, I experienced Swami as a great current of Energy flowing through me to others. There are times in the prison that the same experience occurs. The Energy sometimes seems so strong that I feel I am plugged into the electricity mains. I notice this is always a time when someone has a need for something as basic as forgiveness for their crimes or support in times of grief. It is beyond my control, but happens when I open myself to Swami in my efforts to help the man. There have been times when the presence of God seems extraordinarily strong and profound. At these times there is often a period of conflict and difficulty as too many men take the spiritual energy to their ego and regard themselves as “the best Christian in the unit”. Then there may be fights as to who it is that speaks for God. Ego is the great enemy in the prison, as much as in any place else. At present we are going through a time when there is very strong spiritual energy in the unit, with many of the men undergoing transforming experiences or great blessings. I urge the men to keep quiet about what has happened so as not to give rise to jealousy in the other men. Many of the events we might recognise as miracles go unnoticed as a result. I do not speak openly about Swami, but always present His message in combination with a Biblical text, which it is easy to do. Some men ask me, in private, questions of spiritual nature that go beyond Christian orthodoxy. They may be along the lines of past lives and karma. In response, I give them material from various sources, possibly including Swami, without mentioning the name. When the questions are persistent and sincere, I may give them a book about Swami or a printed discourse that answers the question. This is when the moment of Truth arises! There is an inmate, a man whom we shall call Arthur. He asked me some very searching questions that I could only answer with reference to Swami. I started giving him some material and he kept asking for more. He told me that he was having trouble meditating so I gave him a book from the UK on light meditation. I followed it up with information on the Gayathri Mantra and a CD with Swami chanting the Gayathri Mantra 108 times. He started to chant the Gayathri Mantra with Swami each morning, and very soon Swami began to visit him in his cell several times. On his own volition he became a vegetarian and had a battle with the prison administration to change his diet. “I was first introduced to Sathya Sai Baba by a devotee, Peter Phipps, who was facilitating the Christian group programme in the Faith Based Unit in a New Zealand prison, where I am at the moment serving time for drug offences. By the time I met Peter I was determined to find the meaning and reason for my existence. I asked him for information on some of the spiritual questions I had. He presented me with materials either by Swami or about Swami to read. When I began to study the materials and the teachings of Swami, I was so struck by the Universal Truth they teach. This really motivated me into more inquiry about Swami. I was very blessed because Peter was always gracious to answer my questions. I spent a long time with him in talks about his experience with Swami. This was the beginning of everything for me. Since I used to sometimes bring Sai literature to answer Arthur’s queries, one day as I was photocopying some pages from Sanathana Sarathi for him, I spoiled the first page by inserting it the wrong way into my copier. It had a picture of Swami, in colour, together with an extract from the discourse. I would never destroy a sacred image of Swami and wondered what to do with it. I was prompted to take it in to Arthur. When I went into the prison that day, Arthur told me “Swami told me to ask for a picture of Him”. I told Arthur I had the picture with me. He was overwhelmed. Since then he has made a frame for the picture and the quote and displays it in his cell. 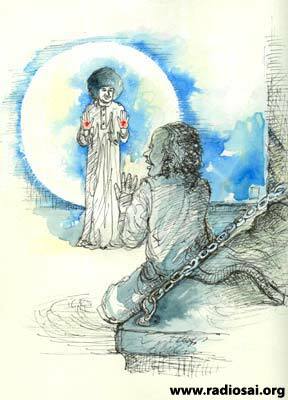 Several other prisoners as well as custodial staff note the picture and the Divine quotation and ask Arthur about it. Several staff members as well as his fellow prisoners are drawn to the picture and ponder on the wisdom of the words. Before last Christmas, Arthur was on a three-day fast and was hungry. He was also concerned about finding sufficient money to buy noodles as a present for all the 60 prisoners in his unit, but did not have enough funds. He had managed to have only 54 packets of noodles and was trying to decide who should not get a packet. On the second day of his fast, on December 23, as he was praying, his cell filled with a bright light and he opened his eyes to see Swami dressed in white, holding up bleeding palms. Swami told Arthur that he and Jesus Christ are the same. 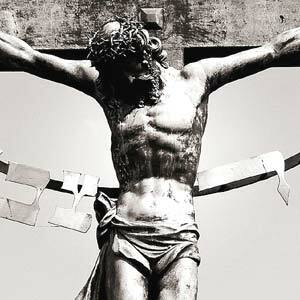 He said Jesus had transcended body consciousness and did not feel pain during the Crucifixion. He told Arthur to complete the fast and that he would no longer feel hunger. Addressing his other concern, Swami also told Arthur to distribute the noodles to all and assured him that there would be sufficient to go around. When Arthur enlisted the help of a friend, another inmate, whom we shall refer to as Bill, to distribute the noodles, he pointed out that they were insufficient for everyone. Yet when Arthur and Bill got together again, they were astonished to find that every man in the unit received a packet and there were eleven left over! I requested both the prison inmates concerned - Arthur and Bill, to share their individual reflections of the experience. One early morning of November last year  I was chanting Gayatri in my prison cell. I still had about 30 to go when the prison staff came around to unlock the cells. I prayed to Swami to please help me to finish before the staff gets here. The time was 7.15 am. I finished the mantras before the door was unlocked and the time was still 7.15 am. I couldn’t believe what was happening. I felt like time was standing still. This experience, coupled with the previous occasions when Swami has appeared to me, left me with a deep sense of love and devotion to Him. As I continue with my sadhana, Swami has come several times into my cell and talked to me. Ever since I became aware of His Divine Presence in my life, it has been like coming home to where I belong. Before Christmas I decided to undertake a three day fast to help me to clear some issues I had with the person of Jesus Christ and Swami. I gave my food to the others with joy because I knew that Swami would take care of me. On the second day of my fast, December 23 , I was feeling very hungry physically and was in hunger pain too. I was on my knees praying to Swami in my cell when suddenly I felt a powerful presence with me. I stopped praying and opened my eyes and to my astonishment the room was lit with brilliant white and blue light and the cell seemed to dissolve as there was nothing existing except myself and Swami dressed in white and smiling beautifully. At this moment I had lost the sense of myself. He held up His hands, from which blood was coming from the palms. He was speaking to me but He was not making any sound and yet I could understand what He was saying. He said that He and Christ are the same. He told me that Christ did not suffer on the Cross, as there was no body consciousness. He told me also to continue and finish the fasting and that from that point I would not feel any more hunger pains [this proved to be true]. As this was going on, there was no sense of time or body. I could not tell how long this experience lasted. When He left, I returned to the body and my cell and I was not feeling anything but total transformation and joy. This was the most wonderful experience I have ever had in my life. I had decided before Christmas 2007 that I would present my brothers in the Unit with me with a packet of noodles as a Christmas present. I had been purchasing noodles out of my prison wages. I was quite concerned that despite sacrificial saving from my meagre prison earnings there was not sufficient money to buy for all the men in the Unit. I decided that I and my closest friends would have to go without. On the morning of the Christmas day, I called my friend Bill, and asked him to help with distributing the noodles to the men. We prayed to Swami and told Him to bless the gift and that we are just an instrument to be used to distribute it. I handed a bundle of packets to Bill and told him to distribute them to a group of prisoners, but that there would be none for him as they were not sufficient. I distributed the rest of the food. Bill and I came back in astonishment. We had distributed the food to all those designated and not only was there enough for all, but there were about 11 packets left over. We could not explain it. I recognised at once that Swami had multiplied the food. I was overjoyed at this example of Swami’s Love, Omnipresence and Omnipotence. Bill, who distributed the food with me, was aware that Swami had multiplied the food and was transformed by this experience and has become a devotee as well. Bill, the other inmate at the same facility, has also become a devotee of Swami. He also chants the Gayathri Mantra108 times each morning. 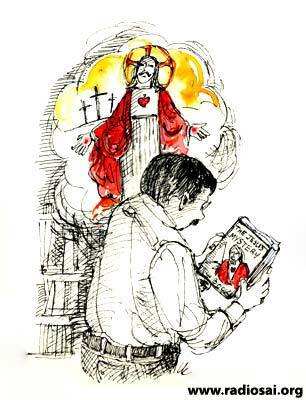 Another man since then has told me that Christ has appeared in his cell and asked for material about Swami. Bill explains what he makes of the Divine phenomenon occurring in the prison in New Zealand. “I grew up thinking that miracles are the stuff of the Bible, never to be manifest in our time. I have come to know of the Being we call Sai Baba, and the miracles He performs for His devotees. 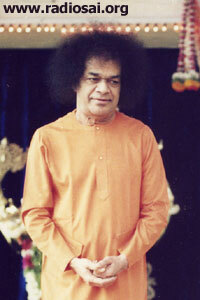 The first time I heard of Swami I knew that He was who He said He is. But like most, I had to pass through the mental barrier I had placed upon myself, believing that only Christ can perform such miracles. Swami has helped me to see that He and Christ are the same Being, manifest in different physical bodies, and that with God there is no limit. The more I read about Swami, His teachings and the miracles performed, I began to truly believe that God cannot be restricted to what we conceive “Him” to be. We believe that nothing is impossible for God, but we are always reluctant to believe that He can do all that He says He is capable [of]. We pray for miracles each day but when a “man” in India begins to perform the very same miracles, we are quick to dismiss them as a trick or an illusion. The illusion is our ignorance of who God truly is. My journey with Christ has shown me that miracles are a natural state of an enlightened man - He that has attained Christ Consciousness, Buddha-hood or closeness with God. When in this stage, miracles are a natural state for the created [man], then isn’t it child’s play for God Incarnate?" 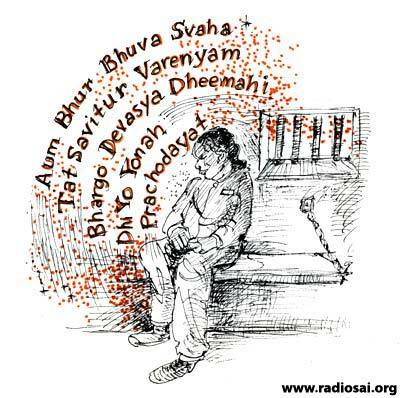 “I am currently a prisoner at a Christian Faith Unit, and last Christmas I was witness to a miracle performed by Swami. Brother Arthur had purchased noodle packets from our canteen to distribute as a gesture of goodwill to the brothers at this festive time. The noodles purchased were not enough for all. At this time, Brother Arthur was fasting for three days prior to Christmas  and Swami appeared to him during meditation. 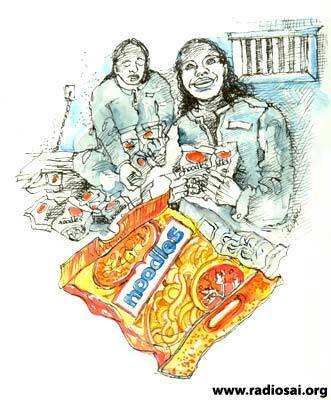 Swami’s instructions were to distribute the noodles [to all the inmates of the unit] and there will be enough [for all]. Brother Arthur asked me to help distribute the noodles on Christmas Day, and sure enough, there was enough for all and some left over. The two of us discussed this chain of events and truth be told. Neither of us was surprised, reason being, when one is surrendered to the Will of God, and works with undying love in their heart for the Lord and fellow brothers, such ‘unnatural’ acts occur. I realise that this miracle happened because of Swami’s Grace, and in my heart I thanked Swami for the blessing and my love for Him grew even stronger. Today, my work as a prison counsellor is still evolving, and lately at a more rapid pace. Five men so far have been told of Swami and all accept Him for who He claims to be, but not all yet feel called to practice His teachings. Only two of the five could be described as committed devotees. They need nurturing, and Swami is ensuring that they get what is needed, whether by appearing in person or telling them to “ask Peter”. I need to be careful because due to their limited understanding of Swami’s Universal Message, which is all inclusive and validates every one of Jesus’ teachings, my fellow facilitators may mistakenly conclude that I am fostering a non-Christian religion or philosophy. It is interesting that many custodial staff and prisoners are open to Universal Truth as being more sensible as the narrower “Jesus is the only way to God” line that we are supposed to teach. I have no doubt that Swami is richly blessing this work and is preparing some men to be great ambassadors for Him both in prison and after release. Interestingly, a large part of the success of the project is that prisoners generally have a great spiritual hunger. Many suffer from acute feelings of guilt and remorse. Many genuinely want to change themselves to avoid coming back to prison or to become better fathers or husbands. I have found that in parish work in the community, there is not the same level of hunger or dissatisfaction with themselves as to who or what they are. People only ask for feeding when they are hungry, and one does not find this level of spiritual hunger in the community. 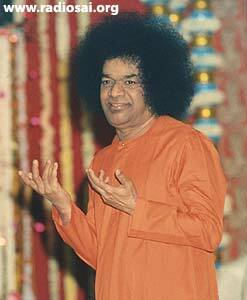 The multiplication of Swami’s grace through the unit is, truly, leaving me quite stunned. Those lads with their intense sadhana, application of Swami’s teachings and their hunger for Truth would leave most of us ashamed. They are getting the Grace they deserve. Apart from the few we have been discussing, the rest of the unit is extraordinarily gracious. When, a few months ago, the prison system had to increase the lockdown hours due to staff shortages, the men rejoiced and held a service of thanksgiving. Other units experienced various degrees of anger. The men are now locked down for 15 hours per day in single cells. There are over 20 units in the prison complex, but I am hearing that the level of violence is now decreasing in the other units. I have had the sense for a long time that we can start a spiritual revolution in Unit 7 that would then be taken out to the subculture who largely form our criminal population. Once the revolution starts with those at the bottom of the social pyramid, it should then extend to the rest of the country. I think we are seeing the start of it. Swami once told a New Zealand group that in time to come “New Sailand” will provide and example of stability to an unstable world. To be an instrument for Swami’s Mission is a great privilege and I recommend Sai devotees should consider whether they, also, should be ministering to those in prison. What better way to explain the joy of my bonding with fellow aspirants, my brothers in the prison, than by quoting what Arthur has to say of Swami’s presence in his life? “ I am at loss to find the proper words to describe what Swami is doing in my life. I have come Home. Swami’s Love is my Home and that’s where I belong forever and ever. Victim Support Team: In 1990, I attended a course on Victim Support taken by two visiting Americans. Included in the course was a half-day on mass murders. The course members protested that these things do not happen in New Zealand, but the trainers insisted that this was part of their training. The last mass murder had been during World War II. Ten days after we completed the course a man at Aramoana, near Dunedin, had an argument with his neighbours, shot the family and then started a brief shooting spree that left 13 people dead, including four children. I was invited to be part of a team of three to comprise a Victims Task Force. Our job was to deal with surviving members of the community and provide counselling and support for those affected. We were quickly on the ground and stayed for only two and a half days. Part of the model we used states that we do not bond with the community but set up support systems to help the community deal with the issues themselves. The killer, David Grey, was shot by Police about the time we landed at Dunedin Airport. Our work was highly successful, as the mental health problems such as Post Traumatic Stress Disorder did not develop in the community. This can be attributed to the very early intervention undertaken by the Victims Task Force. Prison Fellowship: This is an international movement started by Charles Colson. He had been one of the staff of Richard Nixon during the Watergate scandal of the early 1970’s. He had become a Christian in 1973 and was becoming uncomfortable with the culture of the Nixon Administration that any means at all were justified to protect the President from criticism. A number of illegal acts were performed by people who included members of the Central Intelligence Agency. The Watergate burglaries were an attempt to find incriminating evidence on the Democratic Party as well as spy on their election strategy. Colson decided to be true to his principles and plead guilty to Watergate-related charges in 1974. He was given a one-to-three year sentence and served seven months at Alabama's Maxwell Prison. He was appalled at conditions in prison and on release formed Prison Fellowship Ministries, which has become the world's largest outreach to prisoners, ex-prisoners, crime victims, and their families. There are now more than 40,000 workers and volunteers in over 100 countries. It is based on Christian principles.